Tuesday, April 2nd, the Waynesville Middle School Battle of the Books participated in the Region 8 competition. The winning teams in eight of the western counties battled it out to advance to the state competition in Raleigh. A huge congratulations goes to the WMS team for securing a solid second place. Even though the team was missing two strong members, the team stayed calm and positive throughout the day, continuing to add to their overall score with each round. 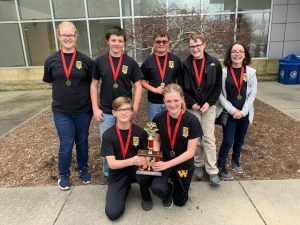 North Windy Ridge Intermediate from Buncombe County secured first place and the WMS team had a strong finish to secure second place from Rugby Middle School in Henderson County. Kairi Cicman and Scarlett Strickland read all 27 books on this year’s list.